Sunset over Dakar from Gorée island, an ex slave slave colony and now a tourist destination in Senegal. 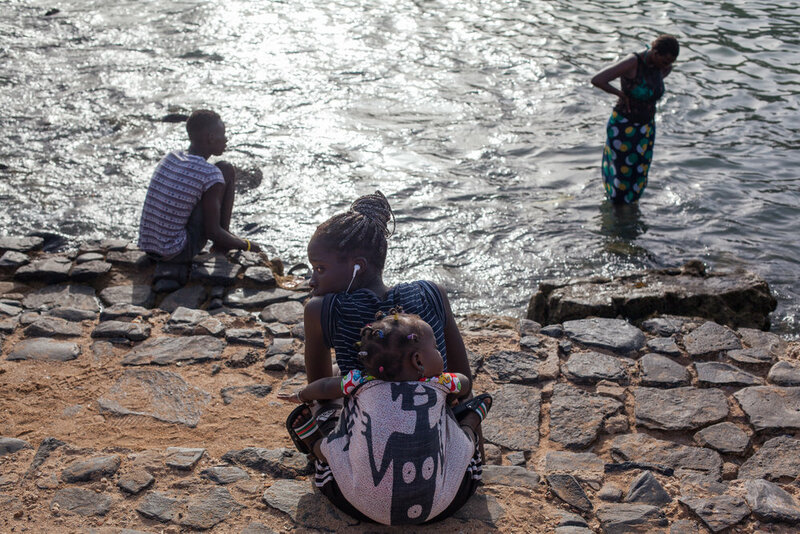 Documentary photography in Senegal. Two boys play football in front of a mosque on the beach in Dakar. Candid portrait of Mother and Baby on Gorée island in Dakar, Senegal. Candid street photography in Dakar, Senegal, West Africa. Street Photography in the Dakar, the capital of Senegal in West Africa. Children lead a sheep to the ocean for a wash in preparation of the Tabaski festival. The above street photographs were taken in various locations in and around Dakar, the capital of Senegal. Dakar is a bustling Atlantic port on the Cap-Vert peninsula, it's traditional Médina quarter is home to the Grande Mosquée, marked by a towering minaret. The centre has a large number of bustling markets where you can buy pretty much everything. Other areas of interest include: Le Monument de la Renaissance Africaine which attracts a lot of tourists and locals daily to view this huge controversial monument which overlooks the ocean. Ngor Island, home to one of the best waves in West Africa which was first shown to the world in the first Endless Summer movie. Another great spot for social & travel photographs is Yoff Beach directly north of the city centre. Dakar has a growing photography community with regular street photography events occurring throughout the City. Some beautiful street, travel and portrait photographs can be found on the Instagram page, 'Senegal Photography'. The colourful, wide angle street photography of Boubacar Touré Mandémory is beautiful and well worth a look. All of my street photographs from Dakar were taken using a Canon 5D Mark 2 and a canon 50mm 1.4 lens. More of my travel photography from Senegal can be found on my website, my Instagram, and my Flickr account. If you are interested in purchasing any prints, using an image online or would like further information please send me an email at: geraintrowlandphotography@gmail.com.